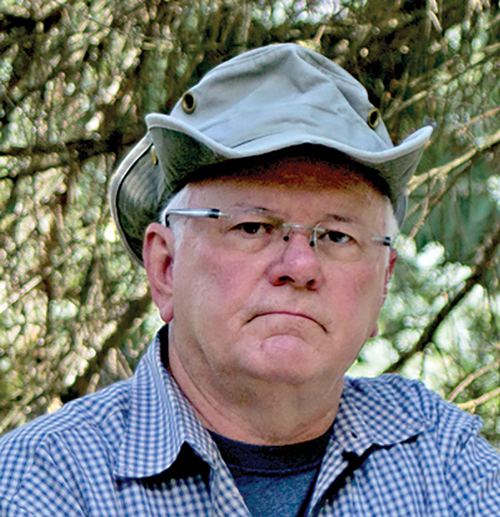 A Summer of washboarding behavior – Some wild guesses and assumptions? I have a three-year-old grandson who has a slight, but cute, speech issue that he is expected to outgrow in just a few years. He speaks his own language that many cannot understand. He is very patient. He has little else to do other than repeat himself until someone – anyone – finally comprehends. Yes, we have previously discussed this topic1, and I do not mean to fixate on this behavior, but I personally find it very frustrating that the bees are right there – performing this behavior right before my eyes, letting me get very near them, and allowing me to watch and photograph them. Yet, I have no idea why they are doing this. For you new beekeepers who are still learning all the bee ropes, washboarding behavior occurs when worker bees very nearly align themselves in discernible rows and rock to and fro with front legs raised. While rocking, the bees use their front legs in a quick quiver movement from side to side. Their tongue may or may not touch the surface of the hive. The behavior looks like some kind of line dance. No kidding. 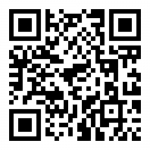 On my web page, I would estimate that I have been given around 40-50 suggestions for what is happening. In my opinion, none have effectively answered the question – what’s happening here? My comments that I present below are not proven facts nor or they formed into a testable hypothesis. My remarks are comments and observations that I present here based on the behaviors of my ten beehives in my one apiary. I made these observations during several Summers. I wish I could tell you that I had a thorough diary and bundles of records. Truth – I’m intrigued by washboard behavior – but not that intrigued. When is this behavior generally performed? This season – only – washboarding began sometime in mid-June and continues until this minute. Today is September 25, 2018. It has been raining for two days and is gently raining at this minute. The temperature is 66, totally overcast, and cool. I made this photograph today of the washboarding activity that was happening this morning. Compared to other years, this year’s dancers, over the Summer, were particularly showy. How many workers perform the behavior? In my beeyard, on my hives, the number of bees washboarding seems to be proportional to colony strength. Colonies may have the same amount of equipment, but a smaller population (due to previous swarming, queen productivity, or general health). The weaker colony will have (apparently) proportionally fewer bees performing the behavior. Figure 1. Still a few washboarding bees on cool rainy day, September 25, 2018. Figure 2. Four deep colony, abundant washboarders, August 8, 2018, 1:00p.m. 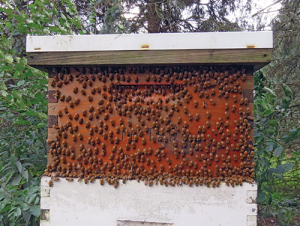 (same hive box as figure 1, different perspective). Where does this behavior occur on or within the colony? You know the drill – within my yard and using my colonies for casual observations, I have observed that bees only washboard (mainly) above colony openings. 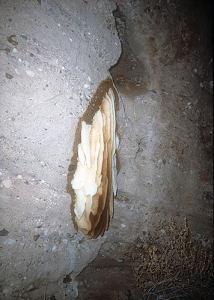 (See Figure 2) A few bees will usually be on the bottom edge of the entrance, but by far most will be above the entrance. Other than those areas around hive openings, I have not seen any bees performing this behavior away from these areas. Bees perform this behavior during warm, Summer nights. The numbers of bees involved in this evening activity seem to be fewer. Maybe it’s the nightshift bees. Note in Figure 2 and in other photos, that during Summer months, I generally push an upper deep back in order to provide an upper ventilation entrance. I provide about 3/8” inch for the opening. That means that I have a smaller opening at the back that is the reverse of the front. No bees washboard on the back. None-the-less there is a back opening. Why no behavior there? Next season, I will provide a 3/8” entrance there (resulting is a wider entrance at the front) to observe if the behavior occurs at the wider back entrance. I have clearly observed washboarding within an observation hive on the inside of the glass. The washboarding bees are not nearly as numerous – even scant, but they are clearly washboarding. Similar behavior, but somewhat different. I don’t know why. Figure 4. Entrance bees are mixed with washboarding bees below the entrance, but only a few bees are performing the behavior above the lower entrance. Plastic hive equipment does not have many – if any wash boarders – on the hive front. Though I wrote above that the behavior was not shown very much below the entrance, plastic equipment with a deep plastic bottom board will have some washboarding bees. In general, on most types of plastic, the behavior is not shown. A comment that has no particular place to be inserted is that bees do not use the upper opening as an entrance. Though heavily guarded and intensively wash boarded by workers, the upper opening is primarily used for ventilation. The occasional drone may use it to depart or return from flights. If you hear hoof beats, you know what to do . . .
To develop a rock-solid assumption, some of the measurements that I would need would be standardized colonies that have the same bee populations. Colonies would need to be in the same types of hive equipment. Individual bees would need to be marked to determine how long they perform the behavior – when they start and when they stop. 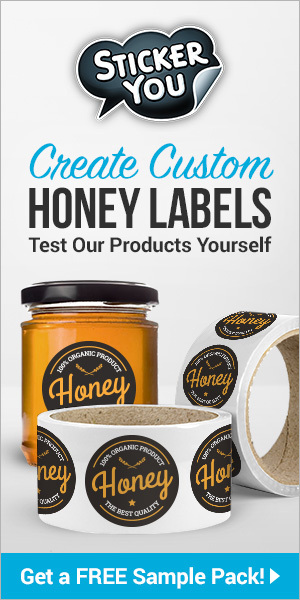 Honey crops from performing bees would need to be excised to determine contents. Hive surfaces would need to be evaluated before and after the behavior has occurred for a measured time. Finally, I would need control colonies that were prevented from performing the behavior. All of these measurements would need replication. Well, I’m not doing all of that. No way. Drum roll . . . therefore, my casual guesses are . . . Figure 5. 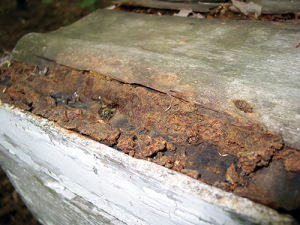 Heavy propolis, applied over time, to improvise an outer cover for a neglected colony. The reason bees do this behavior . . . The bees are laying down a very thin layer of propolis from a thin liquid mixture held within their crop. They are doing this to protect or disguise any opening to the colony. 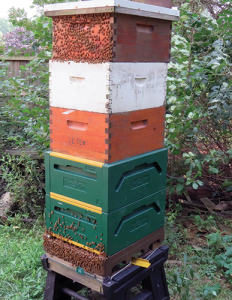 I conjecture that the bees perform this activity each summer because (1) we frequently change hive equipment that subsequently changes openings and (2) the thin surface layer needs recharging. I would suggest that bees rock in rows because it is efficient to cover the area needing to be treated. It is a bit like searchers walking nearly shoulder to shoulder to each other when they search an area for clues to some malfeasance that has been previously committed. If bees did not organize themselves, areas would be randomly wash boarded. Energy and materials use would be used less efficiently. The reason bees are in the head-down position . . . The thin propolis liquid they are applying would respond to gravity and ever-so-slightly flow downward into the wood fibers. The leg movement is to spread the coating material into small fiber spaces while the tongue is applying the material. An analogy would be the application of paint onto a rough wooden surface using a paint sprayer. Very soon afterwards, a paint roller would be rolled over the wet, sprayed paint finish to work it into the wood fibers. Otherwise, the paint forms a surface film that is not embedded into wood fibers that could prematurely fail. If needed, the bees can apply propolis globs and lay down a thick layer, but that would take a huge amount of effort to gather the resin, produce the propolis, and divert workers to the task. I wonder if that diversion would not decrease foraging efficiency? Many years ago, I found a lost colony that had been forced to repair the long degraded outer cover. They had done the job with repeated heavy propolis applications. A better solution would be to use a thin film that is essentially laid down much of the Summer over and again, until the film builds up to a protective barrier composed of thin, laminated layers. Applying gold leaf in multiple layers might be a comparison. The photo of the abandoned nest shows bees’ use of thin propolis applications rather than heavy wads of the material. I feel that the propolis shadow is the same that bees apply to the inside of wooded hive boxes. Why would it not be the same propolis material and procedure used near the entrance? Last Summer, I was planting a Fall season pollinator garden. In order to gently water the young plants, I had a spray wand screwed on the hose end. It was a hot day and many of my colonies had large numbers of bees doing the rocking behavior. Not to harass the colonies, but to see how they would react to a gentle simulated rain shower, I used a high arch to let the gentle water fall on the hot bees working outside. I was startled to see what was left when the working bees moved from the washboard area. A perfect outline or shadow of where they were working was plainly visible. Most of my equipment is painted. As expected, the effects of this behavior do not show up on equipment that has been painted or stained. A second hive showed a similar outline. 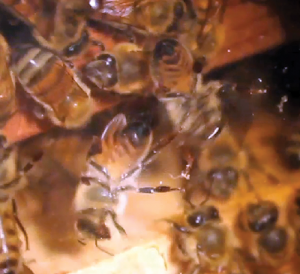 When becoming wet, working bees would move into the colony. However, if bees were in the upper protected edge of the hand hold or sheltered beneath the outer cover rim, they continued to perform the behavior even as the artificial rain continue to fall. On my painted equipment, water would bead into obvious droplets whereas water would spread smoothly on hive painted surfaces that had not been wash board treated. 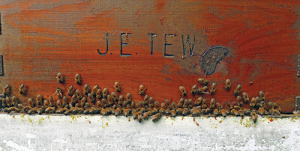 Upon drying, which happened very quickly, the bees were back on the job – rocking and weaving. Only about 30 minutes were needed for the bees to return to the work site. It was a hot day so the water evaporated quickly. In my colonies, where the bees are rocking, most are not where bees are departing and returning. At the upper opening, lots of bees are there, but they are guarding, fanning, and applying propolis along the edges and within the opening. Then there are the rocking bees, doing their thing. The reason I lean toward simple propolis usage is that it is actually visible as the Summer progresses. Occam’s Razor (The Law of Parsimony) is the problem-solving principle that the simplest solution tends to be the right one. One of the simplest answers would certainly be that the rocking bees are either masking or developing a barrier at the hive openings. To those who have gotten to this point, I am aware that I wrote about this in 2016. But you must know that since 2016, I have watched this behavior many spring and summer days. The bees are still doing it, and I’m still watching. Washboarding going on in an observation hive. 3I made this photo (Figure 6) many years ago in Arizona. 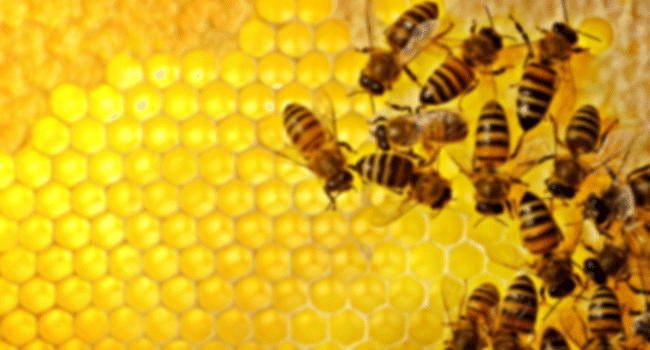 It is commonly said that the propolis barrier is to restrict ant invations. From the photo, I can’t tell if the propolis shield is completely beneath the combs. If it is, I would speculate that the propolis layer is there to clean and prepare the stone for attaching combs to it. Don’t you suspect that it would take more of a barrier to stop the persistence of ants? There I go again – guessing. 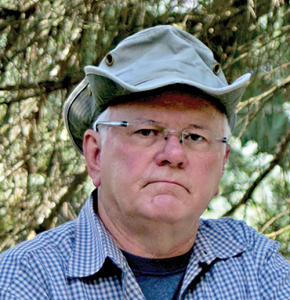 Previous articleCATCH THE BUZZ – Bee Bandits May Be Waiting In The Wings, Ready To Swoop In And Take Bee Hives In California Holding Yards.